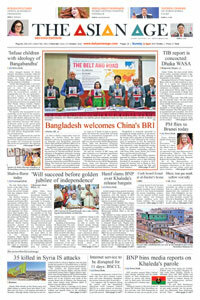 Visiting Heads of Government of Bay of Bengal Initiative for Multi-Sectoral Technical and Economic Cooperation (BIMSTEC) member nations have paid a courtesy call to President of Nepal, Bidya Devi Bhandari on Thursday, reports The Himalayan. Prime Minister of Bangladesh Sheikh Hasina, Chief Justice of Bhutan Tshering Wangchuk, Prime Minister of India Narendra Modi, President of Myanmar Win Myint, President of Sri Lanka Maithripala Sirisena and Prime Minister of Thailand Prayut Chan-o-Cha met with President Bhandari at Sheetal Niwas, the official residence of the President of Nepal. Prime Minister KP Sharma Oli, Minister for Foreign Affairs Pradeep Gyawali and Sheetal Niwas officials greeted the guests. President Bhandari is hosting a luncheon in honour of the dignitaries of BIMSTEC member nations.